Few weeks ago, I received an email inviting me to give a short talk on “the process of creating ideas, campaigns, or innovations”. I’m a bit baffled because I don’t see myself as an “idea creator”. I see myself more as a problem solver. I’m elaborating the content of my talk in three posts. This is the second post, and it is about a new habit that gets us better at changing behaviour. Most of marketing problems are about changing the way people behave. Nevertheless, when it comes to advertising, most of my clients focus on changing people’s beliefs or perceptions. Why is this so? The saying “what doesn’t get measured doesn’t get done” explains it. Measuring changes in perceptions is easy. Measuring changes in consumers’ buying behaviour is much more difficult —and it’s not the same with measuring fluctuations in sales. It is hard to measure consumers’ actual buying behaviour in Indonesia. This is because to properly do so, marketers will need data from a longitudinal research that involves making consumers unfailingly register whatever stuff they buy within a period of time (at least for half a year). This is a complicated and expensive. There are not many marketing research agencies in Indonesia that offer this study to manufacturers; and there are not many manufacturers who subscribe to this service. Enough with the digression. Let’s get back on the habit that gets us better at changing behaviour. Like the previous post, this new habit will force us to leave the old habit that has been deeply ingrained. Let’s start with revisiting that old habit before we kick it off. Most of us still believe that to change behaviour (e.g. buying Brand X more often instead of Brand A), we have to firstly change the relevant perceptions (Brand X cleans better with less effort than the cheaper Brand A), and then change the relevant feelings (from indifferent to reassured with Brand X). This is evidenced by clients insisting on making ads “to educate the consumers” or “highlight the functional benefits” or to “include the logical persuasions”. But then again we still see plenty of people who smoke, or live sedentarily, or text while driving, or have astronomical credit card debt with no savings. Knowledge rarely turns into behaviour. Let’s discard the old habit of thinking the linear link of “belief→ feeling → behaviour” . Instead, let’s start the new habit of remembering the elephant. 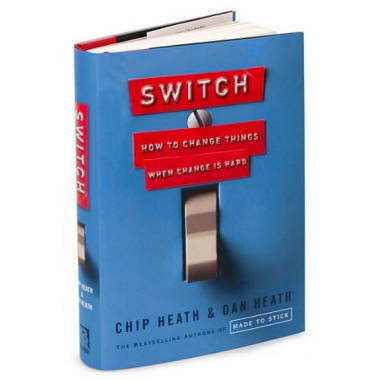 This habit comes from the framework written in the book Switch: How to Change Things When Change Is Difficult by Dan and Chip Heath. What’s genius about this framework is the writers explain it clearly through a powerful metaphor: the rider and the elephant. The rider represents deliberate thinking that is deep, extensive, elaborate, effortful, and thus exhausting (for example, deciding which mortgage to take). Yes, the rider represents the rational human with its advanced frontal cortex. But the rider is tiny and weak compared to the huge and stark elephant. The elephant represents all the subconscious processes that are shallow, spontaneous, slapdash, effortless, and a default mode of how we all behave. The old habit of thinking “belief→ feeling → behaviour” ignores the forceful existence of the elephant. This picture illustrates the rider and the elephant metaphor to understand human behaviour. The rider and the elephant metaphor for changing behaviour. From Switch by Dan and Chip Heath. Directing the rider successfully is to come up with a map that makes the rider feels it’s an easy to get to an clearly-defined place. It is about breaking down a long and abstract journey (“eat healthily”) into sets of short trips, each with a very clear destination that’s easy to visualise (“change full cream milk into 2% milk”). 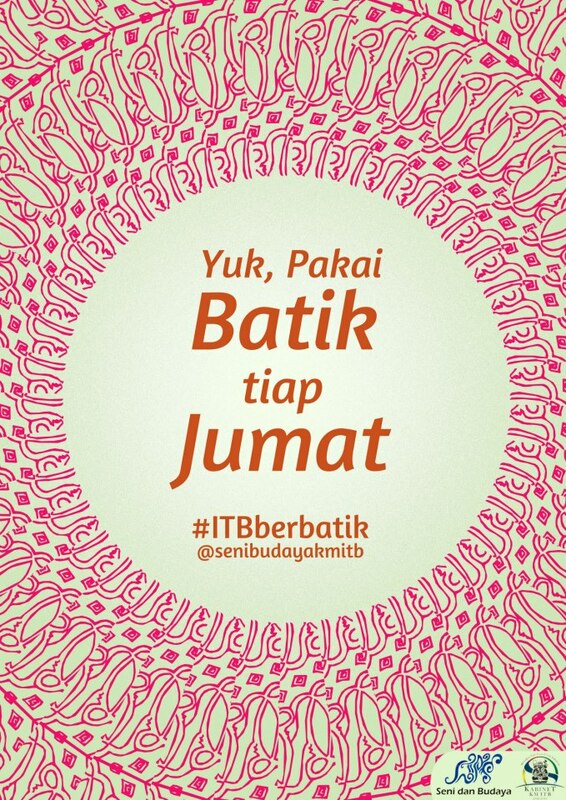 Yet the significant change only took place when somebody or some institution started with a very clear and simple direction of “please wear batik to work on Fridays”. The lofty but unclear agenda of *preserving our cultural heritage” was turned into an attainable small request most people could follow easily. A poster from Keluarga Mahasiswa ITB. Moving the elephant is about using emotions and social identity as the forces that compel the primal side in each of us. Below is a video about using fanaticism towards a soccer club to boost the participation rate of organ donation. In Brazil, families of the deceased often will not authorise organ donations without written wills. This program overcame this barrier by practically offering an instant way to record the donor’s wish. This program managed to increase organ donation participation rate by 54% in a year. Another example is a video to use how emotions are used to solve a real and dire problem: preventing children with cancers from quitting the painful chemotherapy process. I’m eagerly waiting for the report on the success rate of this program. Shaping the path is about tweaking the environment. We have the tendency to underestimate the importance of environment, while at the same time overestimate the personality factor, in influencing the way other people behave. It’s human, and it’s called fundamental attribution error. Previously I have shown examples on ideas that tweak the environment, so it’s much easier to follow the prescribed behaviour, like registering oneself to be a bone marrow donor with a kit included in bandage pack (here), or creating an app that makes it impossible to print out a file (“save as .WWF, here). Another famous example is how schools in New York City tried to improve the grade of students by giving them rewards in terms of talk-time and other content for mobile phones. The initial results were encouraging, unfortunately this program was discontinued due to lack of funding in 2008. This is the video. On the next instalment I will talk about other little habits that prepare my mind, so I believe I am in a better position to catch inspirations. So stay in touch.